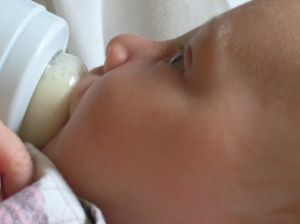 It wasn’t until I chose to switch from breastfeeding to bottle feeding that I truly understood just how segregated some of the breastfeeding population is from bottle feeding mothers. I was part of a breastfeeding group. We all gathered a few days a week with our new babies to talk about life and support each other. There was always open breastfeeding the group. At about three months of age, my first baby girl started getting really cranky and gassy. After changing my diet several times we noticed diarrhea and more gas. We needed to change something quick, so the pediatrician suggested trying formula to control just what baby was putting in her belly since my breast milk was clearly not making her happy. We switched one evening and by morning she was back to normal with no gas and no diarrhea. I walked into the next breastfeeding meeting with my bottle bag in hand and the looks could have stopped my heart dead on the spot. There is a battle that breastfeeding moms prepare for, even if they never go to war. Breastfeeding in public is okay in some places – but not in others. Parents cover the eyes of their children even if you are covered completely. I actually had one mom tell me to sit in the bathroom stall and feed my baby. That is the mentality new breastfeeding moms prepare for. What I didn’t expect was the invisible wall between me and the other mothers in the breastfeeding group. After just two more meetings I left the group and lost the friendships I thought I’d gained. If you choose to breastfeed you are making a fantastic choice for you and baby. The bonding experiences I was able to have were amazing, but I have always considered myself an open and accepting person. Whether you choose to breastfeed or bottle feed, you are taking the best care of your baby as you can and that is all that matters. Previous: Are Newer Drugs Safer during Pregnancy Than Older Drugs?